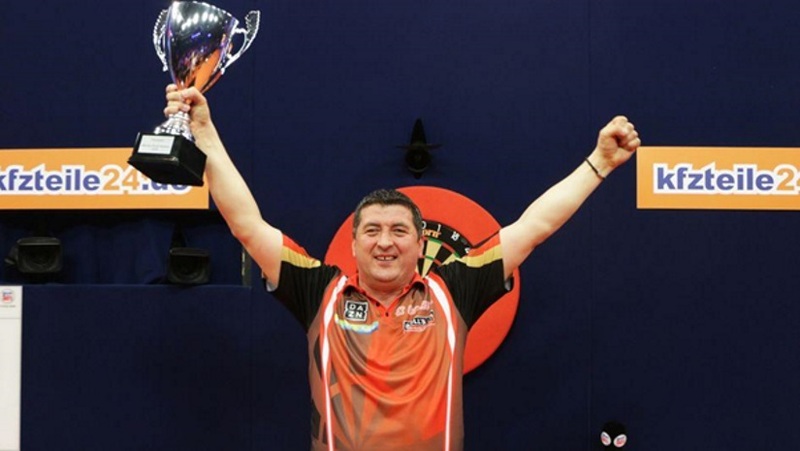 Austria’s Mensur Suljovic won his first World Series of Darts title after beating the young Belgian Dimitri van den Bergh 8-2 in the German Darts Masters last Sunday. The Big Gentle overcame 16 others in front of 20,000 fans at the Veltins Arena. Earlier on in the evening Suljovic defeated Robert Marijanovic 6-2 in the first round before seeing off world champion Rob Cross 8-7 in the quarter-final, which was prior to destroying defending champion Peter Wright 8-2 in the semis. Suljovic maintained his momentum through the final as he put together an average of 101.63 that comprised of five 180s. Suljovic also successfully landed eight of his 13 attempts at doubles in a comprehensive victory. World youth champion, Van den Bergh had soundly beaten Martin Schindler 6-0 in round one, hitting an average of 109.98 on the way. That stat dropped to 94 come the quarter-final but was still more than enough to overcome world number one Michael van Gerwen 8-3. A Semi-Final average of 92 was also enough to put away Gary Anderson 8-7 in a match where the 23-year-old from Antwerp nailed a brilliant 124 checkout, proving he is certainly one to keep an eye on as we move into the latter part of the year. The German Darts Masters was the first of six such events to be staged on the PDC’s World Series of Darts circuit in 2018. Next up, is the U.S. Darts Masters that will be held in the Mandalay Bay Hotel & Casino in Las Vegas in early July. The World Cup of Darts is the next event on our radar and it starts this Thursday in Frankfurt. Scotland, whose team is comprised of Peter Wright and Gary Anderson, are 11/4 second favourites with event sponsors Betway. However, the all-too-familiar Dutch pair of Michael van Gerwen and Raymond van Barneveld — defending champions no less — stand in their way. They are strongly fancied at evens among the 32 nations taking part in the tournament that will be broadcast live on Sky Sports. The Dutch pair will begin the defense against Dyson Parody and Justin Broton of Gibraltar. Snakebite and The Flying Scotsman will match up against Larry Butler and Darin Young of the United States of America in round one, while four-time winners England — represented by Rob Cross and Dave Chisnall — will play the Czech Republic’s Roman Benecky and Karel Sedlacek. England, should you fancy them, are listed at 5/1 chance Betway to win their fifth World Cup title. 20/1 number four seed Australia — led by Simon Whitlock & Kyle Anderson — take on Hong Kong, while last year’s finalists Wales, also 20/1 and featuring Gerwyn Price & Jonny Clayton, will play Thailand. Former finalists Belgium, this year represented by Kim Huybrechts & Dimitri Van den Bergh, are priced at a rather tasty 28/1. They will play their first game against the Republic of Ireland, while number six seeds, Daryl Gurney’s Northern Ireland are 25/1 and will meet Poland. Eighth seeds Austria, also 25/1, will come up against Japan. For the third year in a row Michael van Gerwen has been crowned Premier League champion after he beat Michael Smith in a magnificent show of top level darts at London’s O2. Van Gerwen has now won Premier League titles in 2016, 2017 and 2018, to go with his victory in 2013. 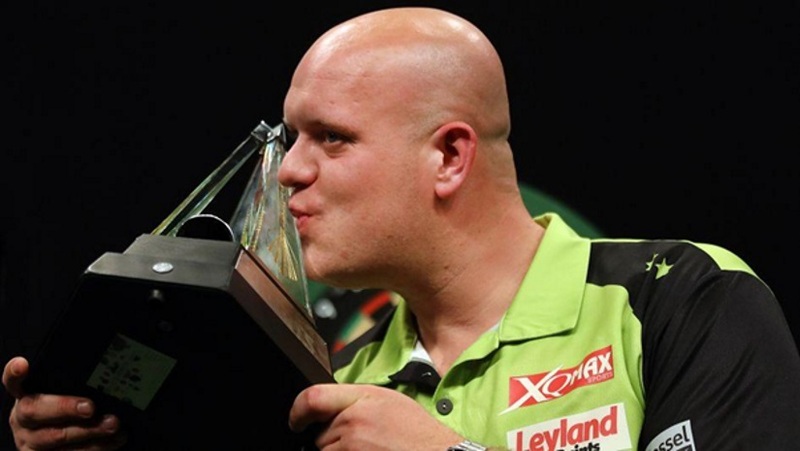 With his latest title, MVG produced one of the all-time great performances as he thrashed Smith 11-4. This included an average of 112.37, the second highest ever in a televised final and just below his own record of 112.49 scored at the 2015 Masters. Bully Boy appeared in his first major TV final after overcoming Gary Anderson 10-6 during the earlier semi finals, managing two ton+ checkouts and six 180s during his four leg victories, but that was as good as it got for the Englishman as Mighty Mike raced into an 8-2 lead. Before long, MVG sealed the win with a 112 checkout, bagging his 11th double in 16 attempts. It was the Dutchman’s sixth successive Premier League final, who qualified by beating Rob Cross in a comfortable 10-6 victory earlier on in the night. Cross was hampered by a sternum injury and only averaged 96 to keep up his miserable form — save for the epic World Championship win last December — against the world number one. Michael Smith, 27, can now feel like he too has properly hit the big time and can be very proud of his League campaign. The 2013 World Youth champion began the season as an 80/1 outsider and third favourite for relegation. Having finished in second place and beating Anderson in the semi-final, a major trophy shouldn’t be long in the coming. The opening event of this year’s World Series of Darts gets underway this Friday. The German Darts Masters will take place in front of a record-breaking crowd of 20,000 at the VELTINS Arena in Gelsenkirchen. Fresh off from his Premier League win last week, Michael van Gerwen has been instantly installed as Betway’s outright favourite, priced at 4/6. Both Gary Anderson and Rob Cross are the nearest challengers in the betting at a much wider 5/1, while Peter Wright — who enjoyed plenty of success last season in these events — is available at 8’s. The entire field versus MVG is worth a shot, which will pay 10/11 for anyone other than the Dutch world number one to win. While we filter out the “also rans” in tomorrow’s round one, there is very little value to be found thanks to a field of mismatches and even a seven-fold on the massively odd-on favourites works out at little over 2/1. Free money for those that choose. After the World Series of Darts, it’s the World Cup of Darts the following week. Because Scotland are favourites, and given his success in these tourneys last season, I’m personally picking Peter ‘Snakebite’ Wright to put his horrid Premier League campaign behind him and get back to his winning ways in Gelsenkirchen this weekend. Gary Anderson made sure of his place in the DPL playoffs by beating the current champion, Michael van Gerwen in a shock 7-5 victory last Thursday night in his hometown of Aberdeen. The DPL Playoffs will take place this week in London, after which we will know the winner of the 2018 Darts Premier League. With his victory, Anderson came in third place in the table meaning he will avoid the Dutchman until at least the final. MVG, who topped the table, will instead play Rob Cross, who finished fourth having won his match. Anderson will play Michael ‘Bully Boy’ Smith in the night’s other semi-final. Back to last week’s action with The Flying Scotsman already assured his place at the O2 before stepping up to the oche after Daryl Gurney had failed to beat Peter Wright by the 7-2 margin that he required in order to jump Anderson. Had Gurney achieved the feat, Anderson would have needed to avoid a 7-0 whitewash but instead got to enjoy a pressure-free game, shooting down the world number one with a superb performance in front of his home crowd. Aberdeen’s Anderson averaged 98 to MVG’s 100.4 as both players eased home. Landing a 112 to send himself 6-4 ahead, Anderson stood steady to put an end to an unwanted sequence of four successive defeats to the Dutchman. An unwell Michael Smith claimed second spot following a 6-6 draw with Raymond van Barneveld. Barney hit three ton + checkouts in the opening six legs while Smith claimed one of his own with a 124 that sent him 3-2 ahead. Both chuckers also threw three 180s as they shared the legs and the points while treating the crowd to a brilliant match despite having nothing on the line to play for. As mentioned, Daryl Gurney failed to get the victory he needed to stand any chance of reaching the play-offs after he also drew 6-6 in his match with Peter Wright. Despite leading 3-1 and 5-2 at various points of the match, Superchin couldn’t find his best form and take advantage of another Snakebite horror show on the doubles. Wright did eventually improve, winning four of the last five legs which allowed last year’s finalist to climb of the bottom of this year’s table, but his goose was already cooked long before this match. For Gurney, he can at least take consolation from the fact he only lost four matches throughout his maiden Premier League campaign and finished a very respectable fifth. In a night of ties, Rob Cross and Simon Whitlock also drew 6-6 in a poor-quality match in which the world champion averaged just 89.31 over The Wizard, who averaged 88.38. Voltage also missed a massive 13 darts at the doubles but at least landed five 180s to show some kind of encouragement going into the London playoffs on May 17. We are down to the final four with the semi-finals held at The O2 Arena in London. The action will getunderway from 19:00 (GMT) and will be broadcast live on Sky Sports. The first match of the night is the semi-final between Michael van Gerwen and Rob Cross. MVG scored a league-high tally of 11x 120+ checkouts during this year’s run to the O2. He has also been utterly dominant against Cross, having won 10 of their 12 meetings, so I will more than fancy his chances in this first-to-10 legs semi-final. For the record, van Gerwen to win, hit a 120+ checkout and average over 100 and Cross to hit the most 180s is worth 11/2 with Betway. The other semi-final is between Michael Smith and a reinvigorated Gary Anderson. It’s his return to form that makes me think that Anderson’s dominance over Smith will continue here. Anderson has, after all, won nine of their 12 meetings to date. The early season was filled with doubt while Anderson was hampered by a back injury when he last lost to Smith, blowing a 5-1 lead on the opening night. Since then, Anderson’s turn around has been nothing short of brilliant. Smith was unfancied at the start of the tourney and has done far better than expected to crash the top four. That said, all but two of Smith’s 20 points this season were picked up against players outside of the top four and he has averaged north of 100 just once all season. But Anderson has played ruthless throughout and improved each week, hitting 18x 100+ checkouts and the second-most 180s (behind Daryl Gurney). Form like that should take him into yet another career final. For this reason, it’s worth taking advantage of this combo bet from Betway; Anderson to win, hit the most 180s and two 100+ checkouts and Smith to average under 100 for 6/1. If the semi-finals go as expected that would make for an MVG vs Anderson final which, if last week’s result counts for anything, could potentially throw up a shock result. Mighty Mike lost to Anderson in the final match of the regular season last week, but beware — his victory at the Dutch Darts Masters over the weekend was his 11th title of the year and the 23rd successful final in succession, demonstrating that the Dutch maestro rarely disappoints when the stakes are high. These two are way ahead of the others when it comes to three-digit finishes, having thrown a minimum of two in a single game eight times between them. Should they meet in a best-of-21 final as expected, another four in the match should prove no problem at all making it a sound wager at Betway that’s worth 14/1. Add value to your final bet with this beauty: van Gerwen and Anderson to reach the final, Van Gerwen to win, Anderson to hit the most 180s and over 3.5 100+ checkouts in the game now worth 14/1. The final prices for an outright win with the online bookmakers Betway are as follows. Bully Boy was an 80/1 outsider for Premier League glory at the start of the season but is now showing at 2/1, while only Rob Cross is longer priced at 7/2. The super short favourite is obviously Michael van Gerwen at 1/5 just in from Gary Anderson’s 2/5.